Glad to hear you got your issue all sorted! It's always nice to learn how to do stuff yourself and this forum is a great place to learn. Another great place is the RRF (rickresource.com/forum), where a lot of us Rick nuts also hang out, and you can post pictures there! Glad you got it sorted out and you found it to not be such a big deal after all...and you got to learn something about your 4003.
yessirs, I did it! hah! I have setup and tinkered on my guitars before I got into bass, the Rick was just a little intimidating since I didn't want to bust my new bass! Anyways, glad it worked out too, thanks to you guys. I'll see if I can get a picture on here. Yep, that looks a great deal like mine. Enjoy! Mine is set up with HB-1s and 500 k-ohm volume pots but only because I have another that is dead stock like yours. Hey man I know! hah! 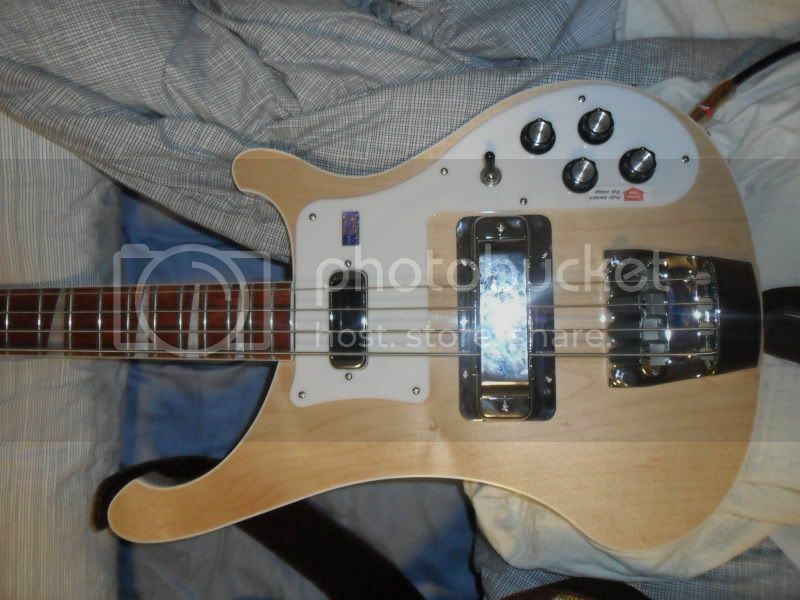 All is well in my Rick bass world... awaiting delivery of my flatwound strings so it can feel complete! No adjustment necessary if I'm going with similar-width of strings, right? Once again, you all got me worrying here, normally I'd just toss 'em on and play! hah! Are you getting Chromes? They sound really nice on a Ric bass. So do LaBella Deep Talkin' Flats if you like more of a steady growl than the subtler nature of the Chromes. If you decide you want to try some of the boutique flats in the future like TIs or "Peer"amids but don't want to risk the big price tag you can e-mail me and I'll be happy to sell you my used sets of those much more cheaply. I have tried both, and didn't end up thinking either were that great, though for different reasons. I used to like TIs a lot but they failed me once in a big recording session, and "Peer"amids just aren't for me. I had the Daddarios on my Music Man, I really liked them. I am trying those Thomastik flatwounds though because my friend has such a great sound from his acoustic strung up with Thomastiks. I'll see what the hype's all about. I'm not too picky though, long as it thuds nice like a flat does, I'll be happy. Then you'll probably be pretty happy with TIs. I tend to be picky.